I love Prague, and one of my favorite things to do there is listen to music. There are plenty of paid concerts. However, having the opportunity to enjoy classically trained musicians playing in the street was an amazing treat. On this 202nd week of Travel Photo Thursday I want to introduce you to a few of these performers. The weekend is definitely the best time to catch performances. There seems to be performers set up not only in the middle of the old town square, but in every nook and cranny in the old town. Speaking of the middle of the square, that is exactly where I found these guys. I’m quite sure this was my first street performing violinist. Then in this little nook were two classical violinists making sweet music. These two were my favorites of the day. 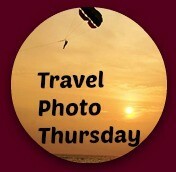 This is the 202nd edition of Travel Photo Thursday. You can browse the archives here. 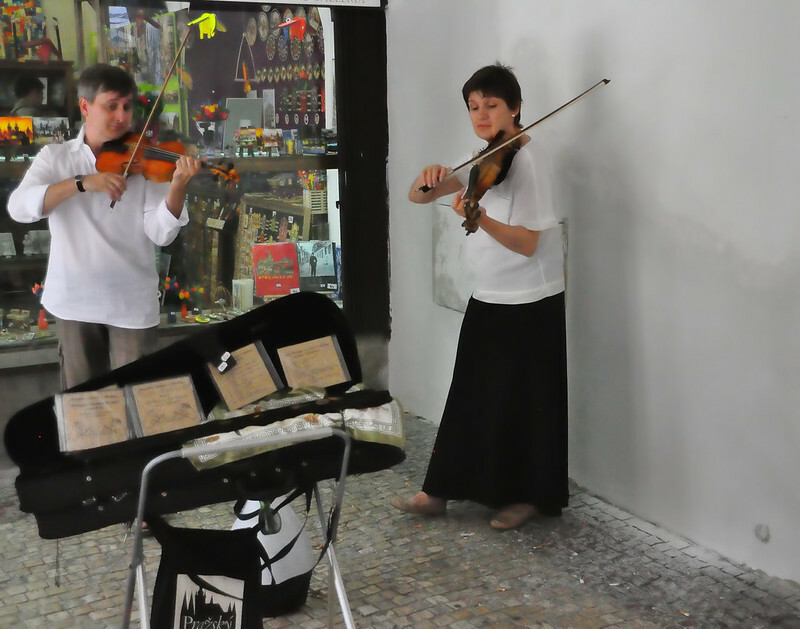 Have you been lucky enough to listen to street musicians performing in Prague? Where is your favorite city in the world to listen to street musicians? Hi Nancie, thank you for bringing me fond memories of Prague. One of the lasting impressions I had of Prague when I firsi visited were the great music played everywhere – on the streets, at the park , in the church, etc. You definitely captured the spirit of music scene of the city. Lovely photos. Hi Marisol. Yes, the music is definitely one of my lasting impressions of Prague, too. Prague is one European city that I would love to see. It reminds me of my time in Istanbul across the Bosphoros to Beylerbeyi where there were heaps of street muscians performing. We strolled down a mall and savoured the different genres of music on a balmy evening. Brings back such wonderful memories. Hi Kathy. I’m sure you would love Prague. I definitely want to get to Istanbul one of these days. Would love to hear the musicians there. Hi Michele. I was a little surprised to find the jazz, too. Yeah, the second guy definitely looked unhappy. Actually that group was playing what I thought were probably Czech folk songs. Looking forward to your next post! I remember the street musicians at the Charles Bridge but we weren\’t lucky enough to see musicians along the Old Town Streets. Probably another great reason to go back.  I would have loved to sit in one of those old churches and attend a concert. Thanks for sharing the video links. Hi Mary. The music performed in the churches, synagogues, and some of the other concert halls was awesome. I would love to go back in the fall when the Prague Philharmonic is playing. I am sure they would be excellent. Hi Jess. Glad you like the new badge. 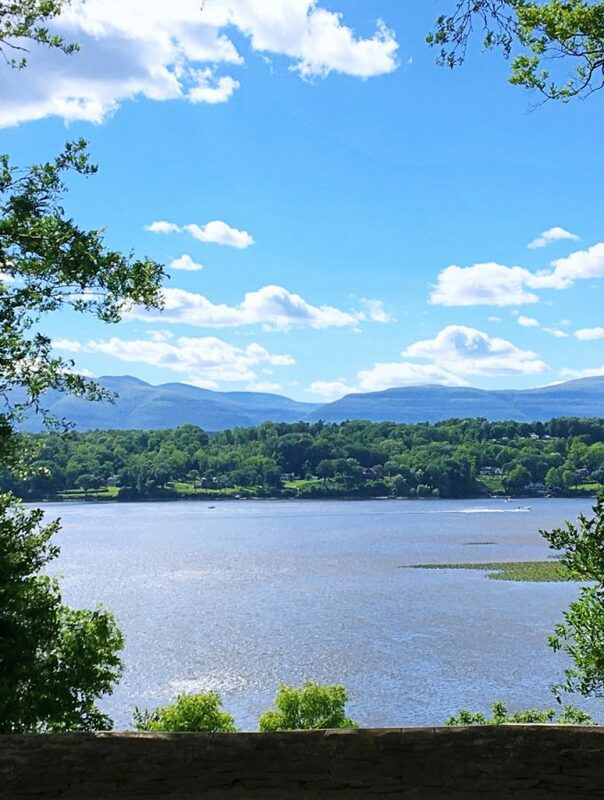 It’s always fun to “spruce up” the blog with something new. I love the sax! I visited Prague in the early 1990s when they were still getting used to outsiders and not always entirely friendly. Nonetheless, I really loved it. it’s a colorful city with so much to offer in terms of history, architecture and beer! 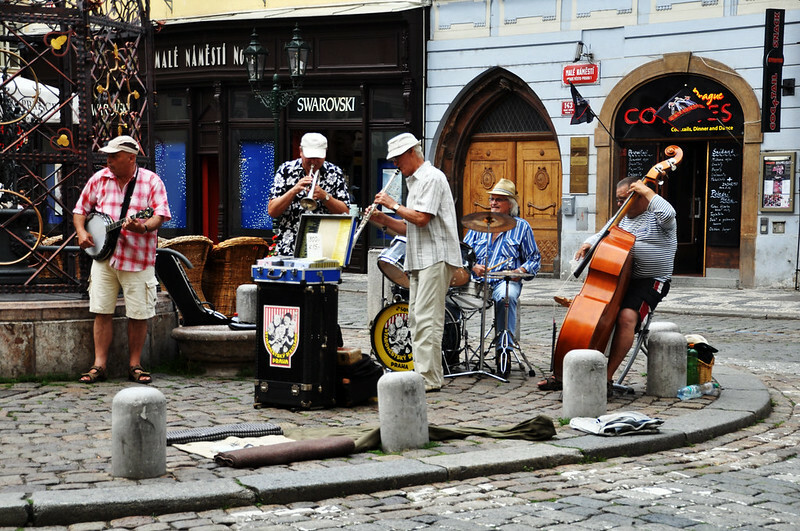 It’s funny, I don’t associate Prague with street musicians at all but that’s probably because most of my memories are from when I lived there in 1979-1983 and that was definitely not a fun period in Prague’s history. Yes, we went to classical concerts at the opera house but there weren’t any buskers. I went back in 2002 and still don’t remember musicians. For me the city with the most music is London. Love the new badge Nancie! Hi Phoebe! You keep surprising me with all the places that you’ve lived!  When I was there a few people mentioned that the government had only recently lifted the ban on street musicians. I remember particularly some Jazz combos in Prague were really good! Although: for some unknown reason Czech artist still seem to be often immersed in a rather dark and gloomy mood. I sorta understood this towards the end of the communism days, but now? Fantastic. Great performances. I’d love to wander the streets of Prague listening to that. I have come across a street performing violinist before, but now I can’t remember where that was. Hi Donna. It was great fun, and really added to the already great ambiance of the city. Hadn’t appreciated that Prague would be so musical. I love the close-up of the very serious looking musician. Hi Leigh. I was pleasantly surprised. Hi Leigh. Yes, it was a pleasant surprise to me as well. Thanks for bringing back fond memories of our trip to Prague earlier this year. I ‘get’ how it was a city of music for you … everywhere we went there were the dulcet (and not so dulcet) strains of music, and always someone different playing on Charles Bridge. Hi Johanna, Yes, the trick seemed to be to find musicians that had found a spot away from everyone else. I just realized that it has been almost 10 years since we visited Prague in 2005! Time most definitely flies. That must have been before they lifted the street music ban because I don’t remember any street music. I think my favorite city for street music is my own—Philadelphia. We live on Rittenhouse Square. The Curtis Institute of Music also fronts on the Square and when I walk the dog, I can usually hear high quality music on all different instruments and voice wafting from there. Then, in the Square there are usually some buskers—a classical guitarist, a Blue Grass duo and some old timer jazz brass players. Hi Suzanne. Nice, that you live close to so much music. 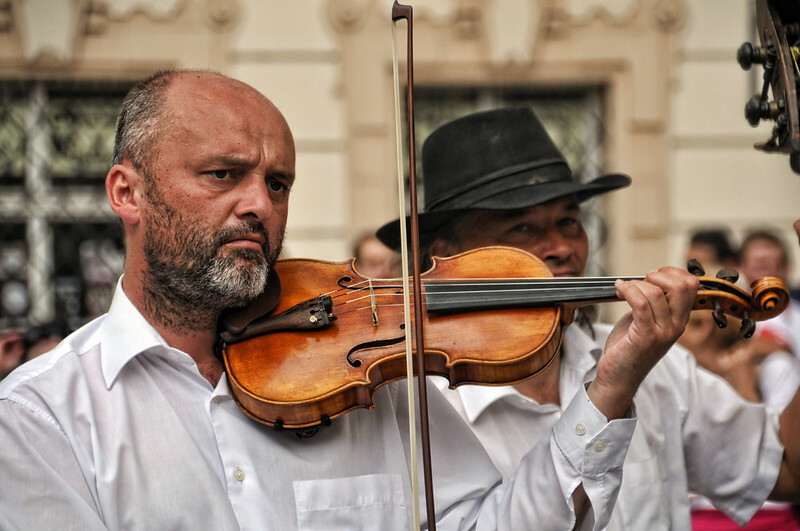 Yes, you’re right about the street music ban. Apparently, it had just been lifted a month or so before my visit. I so enjoyed these photos. Brought back lovely memories of Prague! Thank you. Hi Evelyn. My pleasure. There’s nothing like photos to bring back good memories! Sounds like a delightful way to spend your time strolling through the streets of Prague, admiring the architecture and listening to the music. 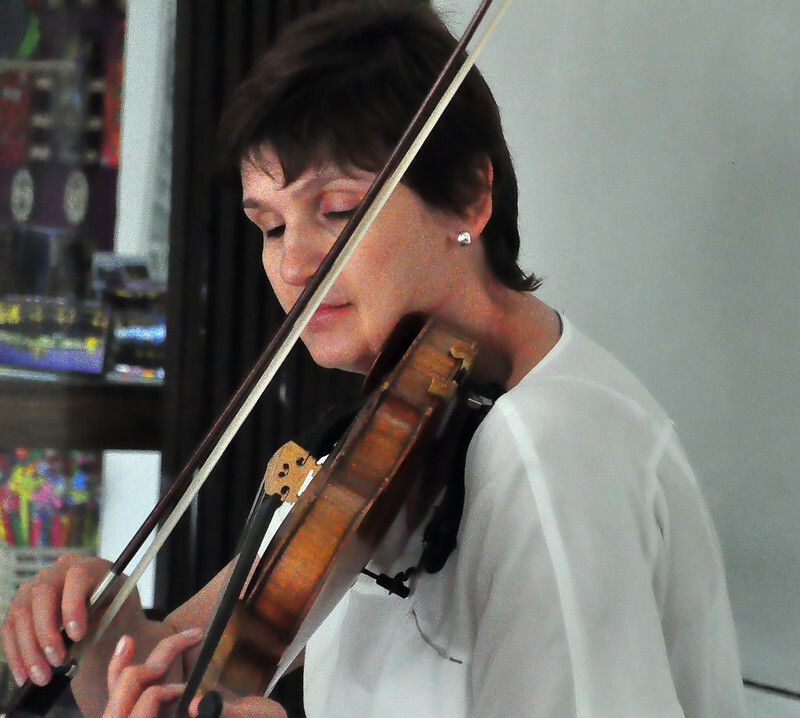 Your photos of the musicians are very expressive – I’m so looking forward to visiting this city in 2015! Street music adds so much “life” to the fabric of any city! A nicely caught series, Nancie, and I enjoyed the videos, too. Quite a contrast from the folk sounding trío with accordeon, the violinists’ Ave Maria and the tradition jazz. I’ve not yet been to Prague, but it’s very much on the list. And as far as music in the street, I’ve heard some really good Andian folk music in the streets of Santiago over the years.